Look up olive in Wiktionary, the free dictionary. Olive is a dark yellowish-green color, like that of unripe or green olives. As a color word in the English language, it appears in late Middle English. Shaded toward gray, it becomes olive drab. 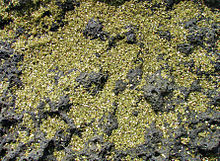 Olivine is the typical color of the mineral olivine. 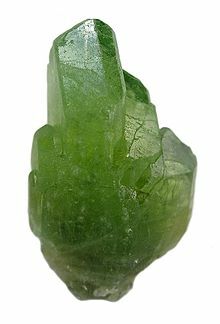 The first recorded use of olivine as a color name in English was in 1912. "Olive gray" redirects here. For the British actress, see Olive Gray (actress). Olive drab is variously described as a "dull olive-green colour" (Oxford English Dictionary); "a shade of greenish-brown" (Webster's New World Dictionary); "a dark gray-green" (MacMillan English dictionary); "a grayish olive to dark olive brown or olive gray" (American Heritage Dictionary); or "A dull but fairly strong gray-green color" (Collins English Dictionary). It was widely used as a camouflage color for uniforms and equipment in the armed forces, particularly by the U.S. Army during the Second World War. The first recorded use of olive drab as a color name in English was in 1892. Drab is an older color name, from the middle of the 16th century. It refers to a dull light brown color, the color of cloth made from undyed homespun wool. It took its name from the old French word for cloth, drap. Olive drab was the color of the standard fighting uniform for U.S. GIs and military vehicles during World War II. U.S. soldiers often referred to their uniforms as "OD's" due to the color. The color used at the beginning of the war by the U.S. Army was officially called Olive Drab #3, which was replaced by Olive Drab #7 (hex code #3C341F) by 1944, and which was again replaced by Olive Green 107 or OG-107 in 1952, and continued as the official uniform color for combat fatigues through the Vietnam War until replaced in 1981 by M81 woodland camo fatigues as the primary U.S. uniform pattern (based on the ERDL pattern used by some soldiers in Vietnam), which retained olive drab as one of the color swatches in the pattern. As a solid color, it is not as effective for camouflage as multiple-color camo schemes (e.g., U.S. Army Combat Uniform, Tigerstripe, MARPAT, Multicam etc. ), though it is still used by the U.S. military to color webbing and accessories. The armies of Israel, India, Cuba, Venezuela, and Austria wear solid-color olive drab uniforms. In the American novel A Separate Peace, Finny says to Gene, "...and in these times of war, we all see olive drab, and we all know it is the patriotic color. All others aren't about the war; they aren't patriotic." There are many shades and variations of olive drab; one common version is defined by Federal Standard 595 in the United States. An olive drab M-1943 field jacket, worn by US soldiers during World War II. Olive drab is the uniform color of the Israel Army. Cuban soldiers in olive drab. "Olive green" redirects here. For other uses, see Olive green (disambiguation). 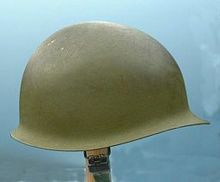 An M1 helmet, the standard helmet of the U.S. Army from 1941 through the Vietnam War. This helmet is from the Vietnam War; the color is olive green 107. Displayed at right is the web color dark olive green. Black olive is a color in the RAL color matching system. It is designated as RAL 6015. The color "black olive" is a representation of the color of black olives. This is one of the colors in the RAL color matching system, a color system widely used in Europe. The RAL color list originated in 1927, and it reached its present form in 1961. The term "olive-skinned" is sometimes used to denote shades of medium-toned skin that is darker than the average color for Caucasians, especially in connection with a Mediterranean ethnicity. ^ "Olive – Definition of olive by Merriam-Webster". merriam-webster.com. ^ The color displayed in the color box above matches the color called olivine in the 1930 book by Maerz and Paul A Dictionary of Color New York: 1930 McGraw-Hill; the color olivine is displayed on page 59, Plate 18, Color Sample C6. ^ American Heritage Dictionary of the American Language, 4th edition. ^ "Soldier'S Barracks Bag". Olive-drab.com. 2008-05-22. Retrieved 2009-04-15. ^ "What Does Olive Drab Mean?". Olive-drab.com. 2008-05-22. Retrieved 2009-04-15. This page was last edited on 6 April 2019, at 14:30 (UTC).